Great real estate deals are few and far between these days, which means the most effective way to draw buyers and renters to a listing is with great photos--like the ones above from Gotham Photo Company, a member of BrickUnderground's Real.Est List resource directory and the subject of this week's Real.Est List Spotlight series. “It’s so much more than a picture when the image is of a home. It tells a story,” says Vince Collura, who founded the seven-year-old SoHo-based company after deciding that many of the broker websites he frequented had an amateurish look that could easily be fixed with high-resolution images, some digital clean-up and a photographer with a great eye. In addition to high-res photography, Gotham also provides virtual staging as well as floorplan measurement, videography and email marketing to help market and sell properties faster. “We do have a manual with framing and technical standards, but we are heavily reliant on the photographer’s artistic eye,” says Collura, whose team of 'floorplan artists' and photographers come from all backgrounds (fashion, portraiture, editorial). Gotham offers a slew of other services besides photography. Virtual staging (see examples, just below) removes clutter or adds furniture to empty spaces so buyers can see what a place would look like when furnished. 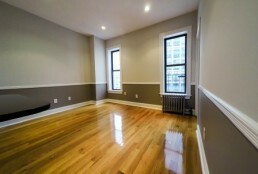 Gotham can even change wall colors or shine dirty windows and floors. ABOVE: Envision, Gotham’s most basic Virtual Staging package, enlivens this room with the addition of a few (virtual) basics. Gotham can also design and send out e-blast announcements, measure or redraw floorplans, and create HD videos to advertise listings. ABOVE: Gotham’s Virtual Staging demonstrates how the addition of window shades, lamps, artwork and even a vase of flowers perk up this empty corner space. Brokers or for-sale-by-owner sellers in need of Gotham’s professional media services—be it photography, video, floorplan measurement or virtual staging—should call the company to get started. Established users who know exactly what they need should simply log into Gotham’s system to choose their desired services using the Client Login page, where they can even request specific photographers they’ve worked well with in the past. Depending on what service and package you choose, Gotham will dispatch a photographer or artist to your property to take pics or video or measure floorplans. You’ll have high-res, print-quality photos (or a newly measured floorplan) within 48 hours. Virtual staging and HD video services take a few more days. ABOVE: Gotham artists can redraw your floorplans the regular way--or in 3D, like the example above. Photography: Basic Rental/Studio Photos ($110 for 4 pics, 30 minutes on site) work best for small rentals and studio apartments. Standard Photography ($180 for 6 pics, 1 hour on site) gets you a little more time with a shutterbug specializing in architectural photography. The Premium package ($310 for 6 pics, 2 hours on site) gets you even more time and is ideal for challenging listings that might require additional lighting. Floorplan measurement: Gotham artists will tour a property in order to get accurate measurements of each room. Prices range between $130 (for 1-2 rooms) and $330 and up (for 9 or more rooms). Note: foyers, hallways and closets are not considered rooms. Floorplan redraws: If you have a copy of a floorplan, but need it redrawn for any reason (often it’s “a fax of a fax or a copy of a blueprint,” says Collura), a Gotham artist can redraw it in 2D or 3D. Prices for 2D drawings range from $45-$95; 3D redraws are $65-$115. Virtual staging: The Envision package ($80 per image) lets sellers show what an empty space can look like fully furnished in any style. Renew ($125 per image) digitally removes clutter and shines dirty windows, counters and floors. 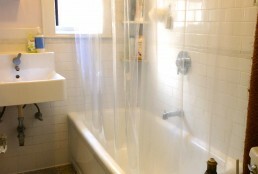 Revamp ($185 per image) can change wall colors and replace kitchen cabinets or other accessories. HD Video: Gotham can generate wide-screen HD videos of any length. Prices range from $395 for a 30-second spot with professional voiceover to the $2,500 Platinum package, with a two-person crew and Hollywood lighting. E-Brochures: Gotham will create e-blast messages ($50 and up) so you can reach the more than 12,000 brokers in the NYC area in one fell swoop. EXPO: Need your media to go full-screen? For $55, Gotham can do it.